It took down Ferrari, now it was time to destroy Bugatti. If you had to guess what was the fastest road car ever clocked, what would you bet? The Bugatti Veyron? Chiron? Something from Koenigsegg, perhaps, or maybe Hennessey? Try again. 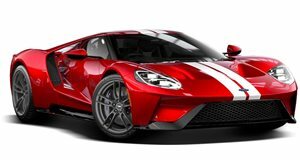 It's this Ford GT – and not the new one, either. This, as you can see, is an example of the first iteration, built over a decade ago with the 5.4-liter supercharged V8 (not the newer 3.5-liter EcoBoost V6). And it just hit an officially timed top speed just north of 300 miles per hour on an airport runway in Texas. As you might have guessed, it isn't exactly stock. This heritage Gulf-liveried supercar was upgraded by M2K Motorsports to produce some 2,500 horsepower. (It was officially dyno'd at just over 2,000 hp at the rear wheels, but that's as high the testing equipment could go.) And yet it's still said to be completely street legal. M2K took the very same vehicle to the Texas Mile at Victoria Regional Airport two years ago and managed to reach 293.6 mph, having previously smashed the record back in 2013. But with their eyes fixed on the triple-century mark, they came back again this year and reached their goal. It's worth noting that the terminal velocity was reached in the relatively short distance of just one standing mile. No flying start, no extra tarmac to keep pushing. So the modified American supercar could very well go faster still if it had the space to roam. Unfortunately a longer stretch of uninterrupted pavement is hard to come by. Hennessey ran on NASA's space-shuttle runway at Cape Canaveral, which runs nearly three miles. Bugatti used parent Volkswagen's Ehra-Lessien test track, with its 5-mile straight. And Koenigsegg had an 11-mile stretch of Nevada highway closed off. Maybe M2K Motorsports could try their luck at one of those.